Samsung’s first dedicated gaming monitor – the curved, Quantum dot CFG70 – reflects its proven expertise in display technologies and features standout specs. 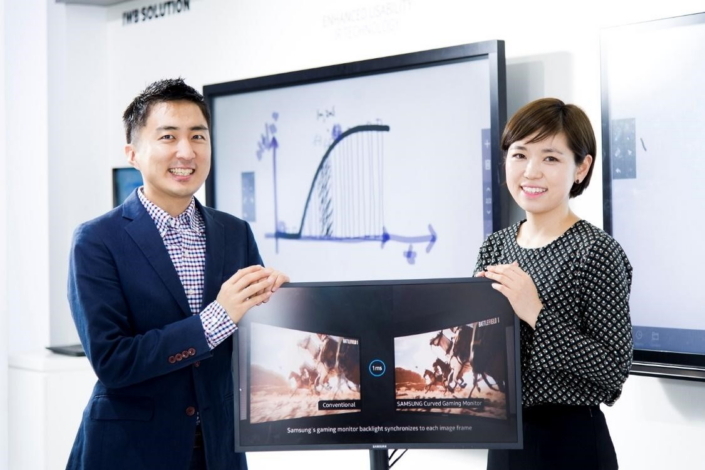 Senior Engineer Hoseong Seo and Marketing Assistant Manager Hyang Go of Samsung’s Visual Display team explain how their team achieved the ultra-fast 1ms mark in a curved monitor, and how the technology manages to deliver smoother visuals and a more immersive gaming experience. Q. The type of LCD panel used in a gaming monitor is key in determining how it displays. How did you select the right one for the CFG70? Hoseong Seo: Gaming monitors feature different types of LCD panels, namely Twisted Nematic (TN), Vertical Alignment (VA), and In-Plane Switching (IPS) or Plane to Line Switching (PLS). But to meet our requirements for image quality and response time, there was really only one answer. The CFG70 features a VA panel, which provides a high contrast range, rich color and a wide viewing angle. We chose a VA not only because they’re the optimal panels for curved monitors, which are scientifically proven to be more visually comfortable, but also because it integrated perfectly with our Quantum dot technology, allowing us to deliver supreme image quality. Most VA panels feature an MPRT (Moving Picture Response Time – the standard for measuring the “motion blur” of rapidly moving objects in a sequence of images) of between 4 and 6 milliseconds. The CFG70’s, however, is just 1ms. Q. What steps did you take to achieve that 1-millisecond mark? Hoseong Seo: The difference is in the CFG70’s impulsive scanning technology. With older, CRT (cathode ray tube) monitors, when a scene changes, the screen will very quickly turn off and back on. The human eye compensates for the gap, and the user sees seamless visuals without motion blur. LCD monitors, on the other hand, do not turn off when a scene changes, which makes them susceptible to motion-blur issues. Impulsive scanning technology reduces motion blur by regulating a monitor’s backlight between each scene. The conventional method to address this issue is to control the backlight from the center of the screen, but this may allow motion blur to remain in the upper and lower areas. The CFG70’s backlights are divided into four sections that synchronize with image frames to eliminate motion blur across its screen. The CFG70 features advanced “four-channel” impulsive scanning technology, which is more precise. It creates a cleaner visual experience by dividing the screen into four sections to remove motion blur more efficiently, and Samsung was the first to apply it to create a 1ms monitor. Q. How did you anticipate gamers would respond to the CFG70’s advanced technology? Hyang Go: Well, while it’s true that gamers greatly value innovation in their visual displays, not all will ultimately choose to buy the products with the most advanced technologies. One reason for this is simply because not everyone sees the difference. We believe that the CFG70 curved gaming monitor’s strengths are very clear, however, and we wanted to give gamers an opportunity to see for themselves. So we invited some gamers to participate in a blind test comparing the visuals produced by its 1ms response time and impulsive scanning technology with those of competing gaming monitors. Ten out of the 11 participants deemed the CFG70 superior, which is a testament to our development team’s hard work. 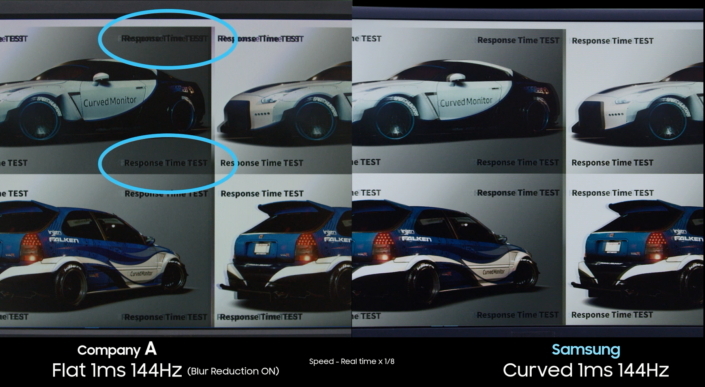 One particularly perceptive participant even pointed out motion blur at the top and bottom of one of the other monitors’ screens, which proves the impulsive scanning technology’s effectiveness. Q. How do you believe the CFG70 will ultimately enrich the gaming experience? Hoseong Seo: Most gamers will carefully examine a number of different specs when choosing a monitor. Though other monitors may match the CFG70’s specs, we believe users of the CFG70 will see a real difference in visual performance. In the end, the CFG70’s response time, along with its Quantum dot color and four-channel impulsive scanning technology, will allow users to enjoy a much more realistic and visually immersive gaming experience than they’d get with other gaming monitors on the market today. 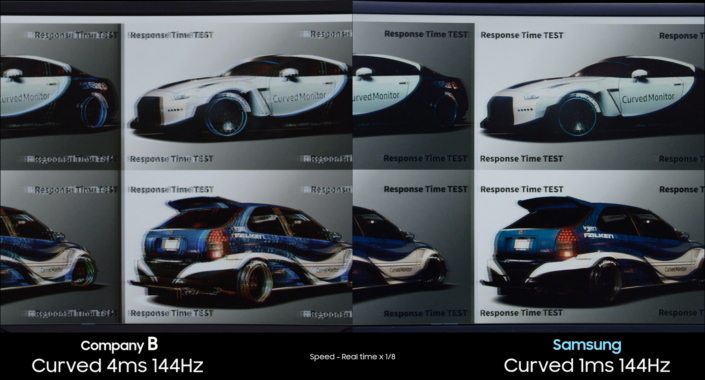 The display of a competing monitor with a 4ms response time is compared alongside Samsung’s 1ms CFG70. The display of a competing flat monitor, compared alongside Samsung’s curved CFG70.